The ability of the rising trot to reduce asymmetry in horses moving in a circle has been highlighted in a Swedish study. The study team had set out to explore the influence of different seating styles on the head and pelvic vertical movement symmetry in horses ridden at a trot. 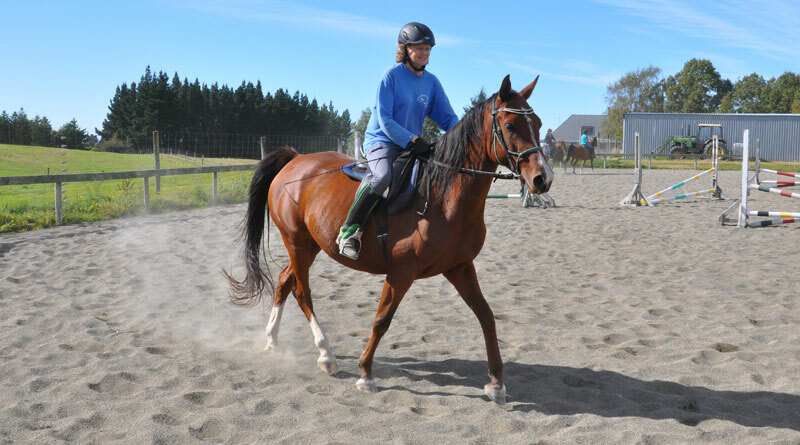 Emma Persson-Sjodin and her colleagues said detailed knowledge of how a rider’s seating style and riding on a circle influenced the movement symmetry of the horse’s head and pelvis may aid riders and trainers in recognising early signs of low-grade lameness. In their study, inertial sensors were used to assess how different rider seating styles affected horses trotting in a straight line and on the circle in both directions. Twenty-six horses were subjected to 15 different conditions at trot – three unridden and 12 involving a rider using three different seating styles: the rising trot, the sitting trot and the two point seat. Only one rider was used for the study, a left-handed intermediate dressage competitor. The researchers, writing in the open-access peer-reviewed journal PLOS ONE, found that the rising trot created systematic changes in the measured movement symmetry of the horses, in contrast to the sitting trot and the two point seat. “The most prominent effect was decreased pelvic rise that occurred as the rider was actively rising up in the stirrups, thus creating a downward momentum counteracting the horses push-off,” they said. On the circle, the asymmetries induced by a rising trot on the correct diagonal counteracted the circle-induced asymmetries, effectively rendering the horse more symmetrical. On a circle, the correct diagonal for a rising trot is defined as sitting down when the outside forelimb and inside hindlimb are in stance (that is, on a right circle sitting during left forelimb-right hindlimb stance and rising during left forelimb–right hindlimb stance). In horses found to have small pre-existing movement asymmetries, the asymmetry induced by rising trot, as well as the circular track, reduced the horse’s baseline asymmetry, depending on the sitting diagonal and direction on the circle. “A push-off hindlimb lameness would be expected to increase when the rider sits during the lame hindlimb stance whereas an impact hindlimb lameness would be expected to decrease. This theory needed to be studied further in clinically lame horses, they said. “The knowledge of how to amplify pre-existing asymmetries in the horses may thus augment the sensitivity of the visual evaluation of low-grade asymmetry,” they added. In effect, the rising trot may be able to be used to identify the type of lameness during a subjective evaluation. The full study team comprised Emma Persson-Sjodin , Elin Hernlund, Pia Haubro Andersen and Marie Rhodin, all from the Swedish University of Agricultural Sciences in Uppsala; and Thilo Pfau, from Britain’s Royal Veterinary College.